We all know that birds have an incredible since of sight, but now scientist have learned even more about their vision. 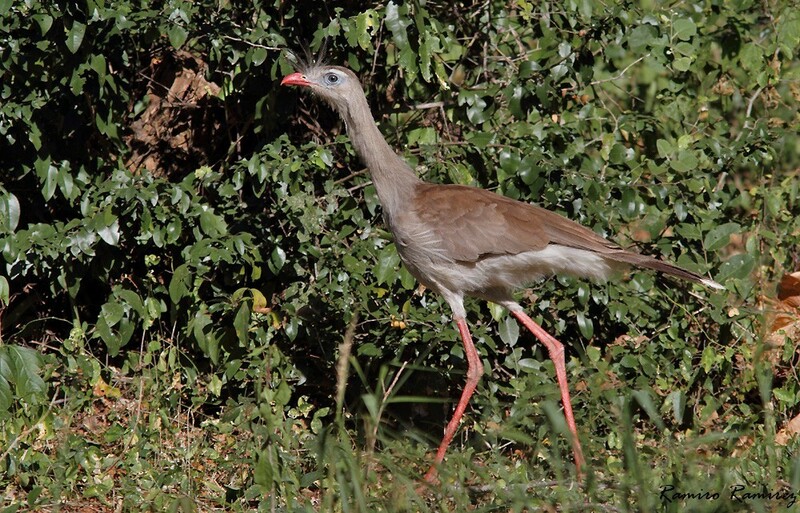 The Red-legged Seriema is a striking, unmistakable bird of open woodland, thorny scrub and hilly grassland. Its large size, bright red legs and bill, and prominent loose crest make it a visually distinctive species. These birds are capable predators and opportunistic feeders with a varied diet, taking a wide range of foods including arthropods, lizards, snakes, small rodents, eggs, corn and other grans, and wild fruit. One of their most fascinating features is their characteristic method of dealing with vertebrate prey. The prey animal is grabbed in the bill, killed by violent shaking and beating on the substrate, and subsequently torn into pieces and consumed. The Red-legged Seriema is commonly found in grasslands and open scrub of central and eastern Brazil. It is believed that seriemas' closest ancestral relatives were the extinct, flightless "terror birds" of Phorusrhacidae, which were fierce predators in the prehistoric Americas. This species has an extremely large range, and is listed as a Least Concern on the IUCN Red list.